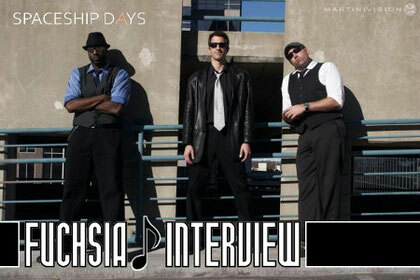 I had interviewed Matt (Right) and Chuck (Center) in the band SPACESHIP DAYS. We talked about the album The Halo Effect and the 2nd album Black Holes and Butterflies what they are working on now. Hi guys! Thanks for accepting this interview. I'm so happy to introduce your band to the Japanese people. I know you have been doing a great job so far. What will you do in the rest of this year as a band? Any plans? For the rest of this year we will be focusing on the release of our second album Black Holes and Butterflies. Being an independent band, we're com pletely responsible for the production, artwork, and promotion for the album so it is a pretty daunting task… but we like the freedom. In the couple of weeks we'll be shooting a video for the first single Shadow Walking which should be available just before the album release. We couldn't be more excited with the progress of this album. It really is the album that we always wanted to make. Big melodies, big hooks, big sounds! I've heard most of songs in your band are written by Matt. I think the songs have a harmonious sound and so sweet lyrics. Tell us which type your band is, does melody come first or lyrics? The music and melody come first. I will sit around with an acoustic guitar and bang around with different chord sequences and rhythms. Writing vocal lines is a pretty humbling experience. I usually sit around humming melodies and making up nonsensical words until something sparks. Once I have the structures and melodies built, I try to sit back and figure out what the song wants to be and write the lyrics based on that feeling. I think the key to being a good lyricist is just constantly being aware of your emotions, being honest. I can imagine its hard all members gather at the same day. Where do you always rehearse and how often do you do that? It is tricky sometimes but fortunately technology has made it much easier for us to share our thoughts and ideas before we all gather at Chuck's house or the studio. However, nothing can substitute the magic that happens when the three of us get in a room together and start playing. Matt has taken to emailing us acoustic demos of songs pretty much as he writes them.That gives us the advantage of knowing the tune and having a pretty good idea of what we want to bring to it so when we do get together each of us is ready to go. In that sense I suppose we practice every day. The rest is a just matter of putting the puzzle pieces together. 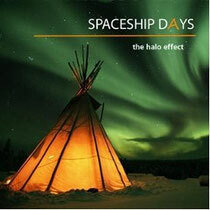 Tell us about some episodes during the recording your album The Halo Effect. What was the hardest thing ever in recording? Did you have any happenings, troubles or funny things? The hardest thing about creating The Halo Effect for me was staying awake. Recording bass is pretty easy - pretending to be interested while everyone else does their thing, not so much. Recording The Halo Effect was actually pretty painless. However, the same cannot be said for Black Holes and Butterflies. In order to get the album released on our timetable somebody got the bright idea for me to record all the vocal tracks for 3 songs in 24 hours. That is hard enough but it is made even harder when your producer "accidentally" installs the microphone backwards. It's even more painful when this little accident is discovered at 2:00 a.m. and revealed to you when your producer says, "Oops, my bad, we're going to have to record that entire song over." That was actually pretty funny, but then I did'nt have to do anything but go back to sleep. This is my personal curiosity but I would love to know. Could you describe the character of your each member? In some ways Chuck and Greg are very similar while being utterly different. Both Chuck and Greg are abnormally intelligent. I often feel like the idiot little brother around them. Both are ridiculously funny and very artistic. Chuck is a rock-star in every sense. When he walks into a room the atmosphere changes and everyone wants to be his friend. Greg is a musical genius and extremely logical… do not try to win a disagreement with him. You will lose. He sees your angle a mile away. His mental kung-fu will crush you. Besides being the funniest person I know, Matt has the most amazing focus. He's like a Jedi.On top of that he has absolutely ZERO songwriter's ego. Considering how far he's come in that regard that's pretty damn cool. It is said sometimes a songwriter makes a song with the personal experimental idea. Do you think there is a true story in your songs? I wouldn't say that my songs are autobiographical but they do come from a very honest place. A lot of times I'll draw on past experiences or make observations of the world around me. Just like I don't have to be standing in poo to know that is stinks; I don't have to be tortured to write a painful lyric. Hope you come to Japan to play one day. We look forward to see you here soon. Let me ask you one more thing. Could we have a message to your Japanese fans? Thank you for taking time for this. We would love to travel to your beautiful country if the stars line up just right. Thank you so much for the support. Thanks for talking to us, and thank you all for helping us share Spaceship Days with the world.